The cloud is no longer just for deploying software – it’s now transforming the way companies physically secure their business. Not only does it reinforce cutting-edge technology to stay ahead of criminals, it also reduces the total cost of managing physical security. Taking advantage of the cloud can empower security professionals to focus on actual security issues rather than maintaining and supporting technology. 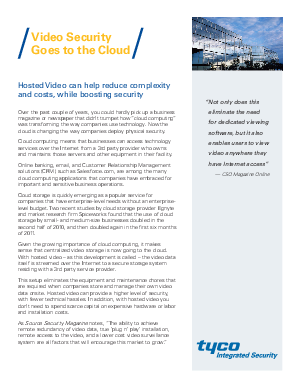 Learn how you can heighten operational efficiency and future-proof your business with the cloud.